There was a lot of creativity around the web this week and I'm thrilled to share my favorites! So sit back, relax, and get to clicking. Oh, and PS. Did you see our newly unveiled Wedding Vendor Guide? It's live, you guys! Yay! I can't tell you how excited I am to have a place to share and showcase my favorite wedding and event pros! Huge hugs and hive fives to these fab pros who joined our guide this week! So happy to have you! Welcome to the family. Events by L, Shine Wedding Invitations, Mospens Studio, RBH Designer Concepts, Spiffing Jewelry, Silk Flowers by Jean, Style This Shindig, Twenty Three Layers, Wedding Favors Unlimited! 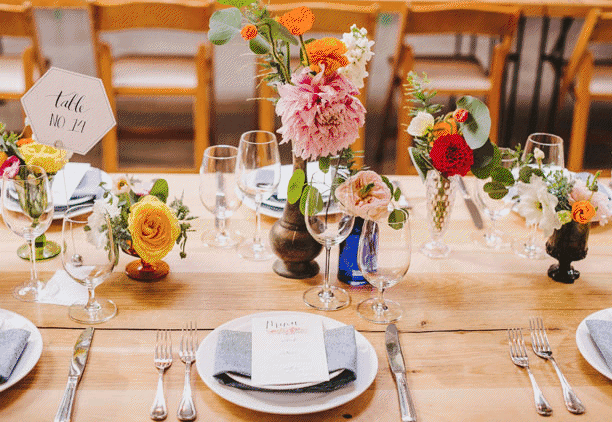 This Fun and Vibrant LA Wedding over on GWS. This Pretty Palette is for color lovers! Did you catch former Bachelorette -- Desiree Hartstock's Wedding? So gorg. I'm loving these Color Palettes from 100 Layer Cake. No Comment to " Welcome to the Weekend | Friday Link Love "